2 동사 어순을 유지합니다. (의문사는 항상 문장의 맨 앞에 위치하므로 be 동사나 조 동사를 그 앞에 넣을 수 없기 때문입니다.) Which car runs fast, the blue one or the green one? 2. How how는 혼자서 쓰이면 어떻게 라는 뜻으로 방법을 물어보고 뒤에 형용사나 부사 를 동반하면 얼마나 라는 뜻으로 정도를 묻는 의문사입니다. 어떻게 로 쓰이는 경우 be 동사가 있는 경우(진행형도 여기에 해당됩니다): how + be 동사 + 주어~ be 동사가 없는 경우: how + do / does / did + 주어 ~ 현재시제 안부인사: How are you? / How are you doing? / How is it going? How do you go to school? / How does your sister go to school? 이에 대한 답은 문장을 평서문 어순으로 바꾸면서 어떻게 에 대한 답을 문장의 맨 끝에 붙여줍니다. How do you go to school? I go to school by bus. How does your sister go to school? She goes to school by train. 과거시제 How were you feeling at that time? How did they get to France? I was feeling terrible. They got to France by boat. 얼마나 로 쓰이는 경우 How 뒤에 long, far, often, old, much/many 등을 붙여서 씁니다. be 동사가 있는 경우: How long/far/often/old/much/many + be 동사 + 주어 ~ be 동사가 없는 경우: How long/far/often/old/much/many + do/does/did + 주어 ~ How long: 시간이 얼마나 걸리는지를 묻는 표현 How long was the meeting? It was from 9:00 to 3:00. How long are you working tomorrow? I'm working from 8:30 until 6. How long did you stay in the US? I stayed there for two years. How long does it take to get to work? It takes one hour. 3 How far: 거리를 묻는 표현 How far are the shops from here? How far do you live from the hospital? They are not far from here. / Not far. How often: 빈도를 묻는 표현. often, sometimes, every day, once a week 등과 같은 표현을 사용하여 대답합니다. How often do you play basketball? I play basketball twice a week. How often does your family eat out? we eat out every weekend. How often is the mail picked up? It is picked up every day. How much/many How much는 혼자 쓰일 때 가격을 묻는 표현이고, how much+셀 수 없는 명사 그리고 how many + 셀 수 있는 명사의 복수형 은 양이나 수를 묻는 표현입니 다. (셀 수 없는 명사는 a/an의 관사를 붙일 수 없고 복수를 만들 수도 없습니다.) How much is a ticket to New York? It's $50. How much did you pay for this car? I paid $5000 for it. How much milk is there in the fridge? There's one carton. How much money do you have now? I have only 5000 won. How many students are in your class? There are 40 students. How many books did you buy yesterday? I bought 3 books. How old: 나이를 묻는 질문 How old are you? I'm 22 years old. / I'm Where where는 장소를 묻는 의문사로서 쓰는 방법은 위에서 설명한 바와 같습니다. be 동사가 있는 경우 (진행형도 여기 해당됩니다) Where + be 동사+ 주어 ~ 대답은 be 동사를 주어 뒤로 빼서 평서문 형태를 만들고 where에 대한 답을 문장 끝에 붙여 줍니다. Where is Mike? He's at school. Where was Maria born? She was born in Russia. 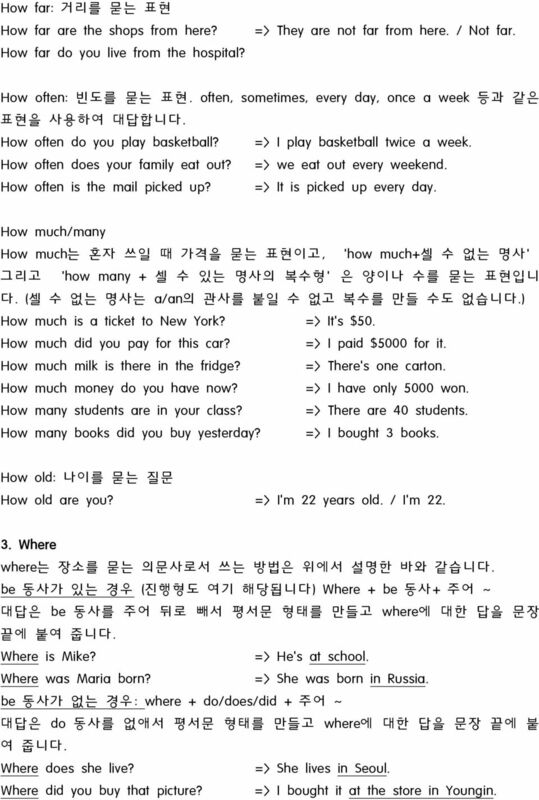 be 동사가 없는 경우: where + do/does/did + 주어 ~ 대답은 do 동사를 없애서 평서문 형태를 만들고 where에 대한 답을 문장 끝에 붙 여 줍니다. Where does she live? She lives in Seoul. Where did you buy that picture? I bought it at the store in Youngin. 4 4. When when은 시간을 묻는 의문사로서 쓰는 방법은 위와 마찬가지입니다. be 동사가 있는 경우 : when + be 동사 + 주어 ~ 대답은 마찬가지로 평서문 문장으로 바꾸어주고 when에 대한 답을 문장 끝에 붙여 줍니다. When is your birthday? It's April 22. When are they leaving? They're leaving in an hour. When was the last time you went to the movies? It was last month. be 동사가 없는 경우: where + do/does/did + 주어 ~ 대답은 do 동사를 없애서 평서문 형태를 만들고 where에 대한 답을 문장 끝에 붙 여 줍니다. When do you do your homework? I do my homework in the evening. When did she leave the party? She left the party at midnight. 연습문제 대답과 어울리도록 when, where, which, how를 넣으시오. 1. are you feeling today? I've got a headache. 2. are you leaving? At six o'clock. 3. did she buy that dictionary? In the bookshop near the station. 4. restaurant do you prefer, the Pizza Palace, or the Spaghetti King? The Pizza Palace. 5. do you have breakfast? At half past seven. 6. song do you prefer? I prefer the Spanish song. 7. is the town center? In Carlton Street. 8. does she get to work in the mornings? By bus. 9. movies do you like better, comedies or horror movies? I like comedies better. 10. does the film start? at 4:30. 밑줄 친 부분이 맞으면 표시를 하고 틀리면 맞게 고치시오. 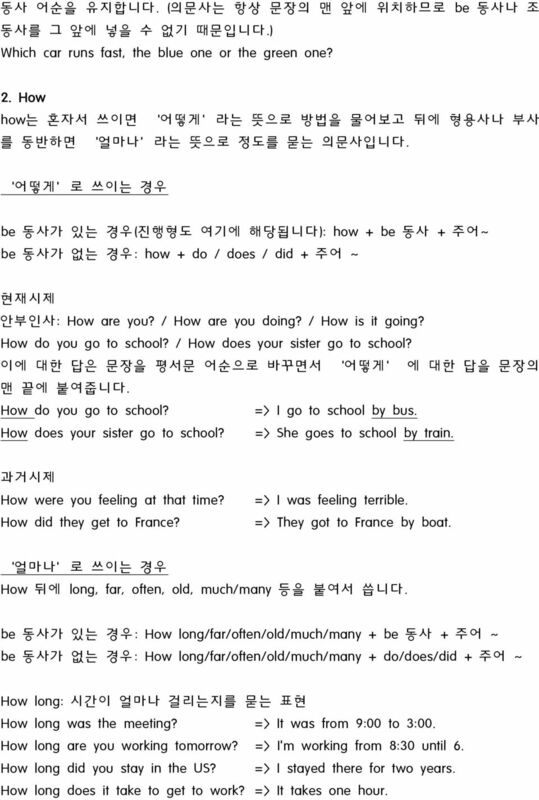 예> How is your brother get to school? does Where do you normally go for your holidays? 11. How is your father? 5 12. When does she finish work yesterday afternoon? 13. Where does Peter yesterday? 14. Which car do you prefer, the family car, or the sports car? 15. How old are you when you went to Australia? 16. How much does a single room? 17. Which train do you catching, the 1:00 train, or the 1:30 train? 18. Where did you buy that painting? 19. How many students do there in your class? 20. Where is the nearest bank? 대답과 어울리도록 How 뒤에 much, many, old, far, often, long를 넣고 시제에 주의하여 문장을 쓰시오. 예> How/you/stay/in New Zealand? I stayed there for six months. How long did you stay in New Zealand? 21. How/he/read a newspaper? He reads a newspaper everyday. 22. How/cheese/you/buy? I bought half a kilo. 23. How/your husband/be? He is 34. He'll be 35 next month. 24. How/the meal/be? I can't remember, but it wasn't very expensive. 25. How/it/be/from here to the nearest bus stop? It's about 200 meters. 26. How/exams/you/be going to take? I'm going to take three exams. 27. How/the lessons/last? (last: 지속되다) They last for three hours. 28. How/you/go to the gym? I go to the gym twice a week. 29. How/you/pay for this computer? I paid $ How/it/take/to go to school? It takes half an hour. 셀 수 있는 명사와 셀 수 없는 명사를 구분하여 many 나 much를 알맞게 넣으시 오. 6 31. How countries have you visited? 32. How work have you done today? 33. How time do you spend answering your s? 34. How languages do you speak? 주어진 대답이 나오도록 적절한 의문사로 시작하는 질문을 완성하시오. 예> A: How often do you go there? B: I go there twice a week. 35. A:? B: They're going to see the film on Friday evening. 36. A:? B: He is studying English at a language school in London. 37. A:? B: They stayed together for twenty years. 38. A:? B: My grandfather is seventy years old. 39. A:, the big car or the small car? B: He bought the small car. 40. A:? B: I drink coffee every day. Self introduction 기본표현 I'm In-ho, I live in Pusan. My hobby is painting. I'm 11 years old. 예문 Wed. Sep. 10th. Cloudy. I'm 영희, and my hobby is listening to music. I'm 12 years old. I live in Dosang dong.